As Mikko's gotten older — he just turned six — I've found my laissez-faire attitude about his (lack of) manners shifting into appointing myself instead his own private Courtesy Cop. And I had this nagging suspicion — more than a suspicion — that at some point I had written a blog post all about how I don't coach my kids to say "please" and "thank you," that I just model it. Yet here I have been, whispering to him, or saying outright, "Remember to say 'thank you'!" or "That's not a very nice way to ask; what would be a better way?" I didn't really want to write about this subject for the carnival, because — well, gee, how embarrassing! But let's delve in, shall we? We try not to (sometimes I slip up!) tell Mikko what to say to be socially acceptable. I never appreciated as a kid having something withheld until I remembered to "use the magic word" or being prompted with a whispered "Tell Grandma you love her!" It felt false to me, like a breach of manners rather than true sociability. When it comes to manners, I don't teach Mikko how to be polite. I model it. (I hope!) I say "please" and "thank you," "excuse me" and "I'm sorry," to him, and to others in his presence. Despite not being "taught" manners, he has them, and he knows how to use them! I remembered that Amber Strocel had disagreed with me in the comments, based on her slightly older child. Wouldn't you know — her daughter at the time is about the same age as Mikko now! I don't require politeness with me, or with family members. And often, my kids come out with it and it's all sweetness and love and all that. But for my 5 1/2-year-old, in public, I sometimes ask her to say 'please' or 'thank you'. For example, if we take advantage of the free cookies at the store I ask her to say thank you to the person who gives it to her. Is it sincere? I don't know. But also, I'm not sure I particularly care. She is beginning to reach an age where she's having her own social interactions with others, and I explain to her that saying certain things smooths the way. I don't withhold or make a big deal out of it. If she's feeling shy I'll say it for her. But she needs to understand how to operate, and sometimes that means that I explain it to her. I wouldn't do the same thing with my 2-year-old, and I didn't do it with my daughter until she was old enough to feel comfortable talking to other adults in public. But I think it's all right to occasionally remind your kid what the polite thing to do would be - it makes others feel good, and it helps them to navigate the world. I don't think that every 'please', 'thank you' or 'sorry' I give is sincere, and so I'm OK with teaching some level of manners without complete heartfelt sincerity behind them. I agree, and I don't. Here's where I totally agree: I don't need every interaction to be from the heart. Plenty of times I say "thanks" when I'm handed a bill. Am I really thankful in such moments? Ha. I also agree that we need to help our kids navigate the world and the social scene around them. All I'm coming from is that as a child there was a lot of prompting that made me feel small and ashamed (even if unintended). Now that I'm a parent, I can see my parents just didn't want to be left hanging themselves and be thought impolite or that they were bad parents. But as a kid, I just thought, Oh, I screwed up again and forgot to say thanks to the cookie lady. OR, I was GOING to say thanks, and my mom beat me to the punch. You know? Whereas, if you as the mother just said, "Thanks so much!" to the cookie lady, smiling at her and your daughter in turn, that might be all the prompting she needs to remember her own thank you. But, I can see where outright teaching would come in handy, too. When I was in junior high, I visited a family that ate much more formally than ours did. I could have used a crash course right there in proper table manners! As it was, I did my best to observe and mimic, but I'm thinking maybe it wouldn't be amiss to do a little manners clinic with slightly older children. Like, your 5-year-old might enjoy a fancy-schmancy dress-up party with her friends, where you all practice saying, "Please pass the tea, Mrs. Crumplebottom." Maybe another thought for a child who needs some help in social situations would be to lean down and whisper in her ear, "I bet Grandma would like it if you said 'please' first" or "It looks like Grandpa needs a hug if you have one for him." Then no one else is hearing the teaching, which limits the shaming effect. What happened to me seems to be what happened with Amber. 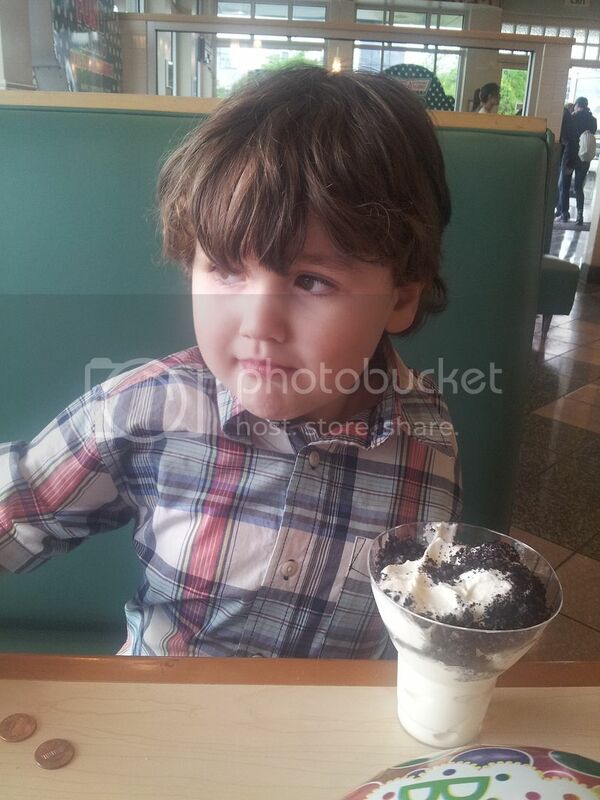 My sweet little three-year-old whom adults could barely understand in any case, and for whom they made tons of allowances because he was so wee (well, relatively…), turned into a six-year-old who loves to take charge when we're out (and we're out a lot): at restaurants, in stores, at museums. He wants to be the one who orders the hot dog at the Costco counter (he'll shoo me away if I get too close); he wants to be the one to ask for a takeout box for our leftovers; he wants to pay for the stamps at the post office; he begs random shopkeepers for balloons and brochures. Now, the upside for him is that he lives in a cuteness bubble. So people are willing to kowtow to him a lot. They nod along as he talks up Club Penguin (his favorite online game). They offer him stickers (UPS is great for this, for instance). They add freebies onto his meal or into his shopping bag. As an example, we went to Krispy Kreme (I know! So healthy! So what!) for National Doughnut Day, because — free donuts! — and the woman behind the counter noticed him carrying his birthday balloons and asked about recent birthdays. She ended up giving both boys a free ice cream with Oreos on top, along with their free donuts. (Can we say sugar shock!) This sort of thing happens to Mikko all the time. That photo at the top? That's my suave dude being all casual about how everyone throws stuff at his feet. And so…I want him to be polite about it. I want him to say "please" and ask nicely when he requests something reasonable or un-. I want him to say "thank you" and smile and act appropriately grateful when strangers strew him with their largesse. I want him to because it's right, because it would hurt their feelings (I believe) if they go out of their way for him and he seems indifferent or, worse, irritable (this does happen, as when they give him the wrong color balloon, or not enough stickers). And since he sometimes asks nicely, and he sometimes says his thanks, but he sometimes does not, I as the parent mediator feel the deep-seated need to jump into the breach. When Mikko was younger, I felt OK speaking for him. As he gets older and sometimes doesn't just say nothing but says the wrong thing, I feel more of a desire for the right phrases to be coming out of his mouth as well as mine. Rereading my older article and thinking through this whole topic has brought me back around to my rather meandering response to Amber: that I agree and don't agree — with myself, both past and present. I think, as Amber was saying, that there does come a point when children might need some coaching on how to get along more smoothly in situations — such as I desired for table manners. I think a little practicing and some playacting wouldn't come amiss. Maybe Mikko and I can have that formal tea party. I do find myself offering him scripts if he's going to approach a counter or employee on his own, making the manners just part of the overall message: "All right, wait until she's not busy and then say, 'Excuse me, I'd like a straw, please,' and then say 'thank you' when she hands it to you." However, I've also been reconsidering how often I prompt for specific phrases, and how I'm going about it. Jennifer at True Confessions of a Real Mommy told me her family uses sign language — easy for the kids to understand, less obtrusive to others. I could also use German. I like the reminder I gave myself (ha) to whisper to the kids to make it less of a performance. Sometimes I feel like I'm saying, "Remember to say 'thank you'!" really obviously for the sole benefit of the other adult — so that person can hear what a proper grown-up I am, and what a good parent. That strikes me as pretty stupid. If the interaction is truly between my son and these other people, then I need to back out of it and let them have their connection. Or, if it's involving me, too, then I need to own it and just say my own thank-yous and leave Mikko to manage his own. I have a sense I'm not done with thinking this through, so I'd love your perspectives as well. Do you prompt your children to be polite? Do you teach manners intentionally or let it develop — or not — organically? P.P.S. 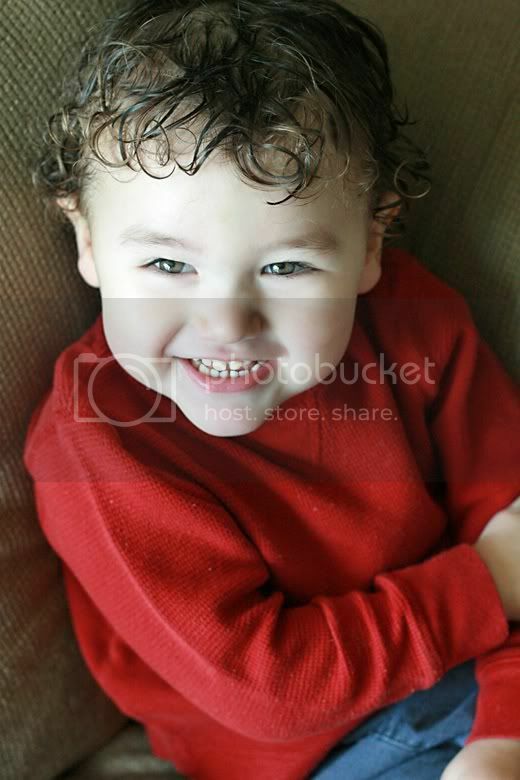 Mikko at three is a cutie. P.P.P.S. In the same post, I write about how he helps willingly around the house and volunteers for chores. Um…yeah. Subject for a future take-back post?? The good news is, I also wrote that he was freely affectionate even though we never cajoled him to hug or kiss us — all of that is still true. Phew!